Archive by category "Feature Article"
The analysts say bacteria make up 13 per cent of life on Earth, while plants represent 82 per cent That leaves all other creatures from insects and fungi to the largest quadrupeds, making up just 5 per cent of the world’s biomass. This joint event will be undertaken by KAI and MBKR at the Caboolture Regional Environmental Education Centre (CREEC) at 150 Rowley Road, Burpengary. Vanda Grabowski, President, Koala Action Inc. (KAI) will provide a general koala education and awareness presentation which will be followed by a presentation given by Lindsay Wickson from Endeavour Veterinary Ecology on the koalas at the Amcor Petrie Mill Redevelopment site. To conclude the day, Anika Lehmann, President, Moreton Bay Koala Rescue Inc. (MBKR) will provide an overview about what is involved in becoming a rescuer or transporter of sick, injured and orphaned koalas. This will be followed by Dr Tania Bishop, Veterinarian, Australia Zoo Wildlife Hospital will provide an overview of the types of injuries and illnesses coming into the wildlife hospital and the rehabilitation process. Dave Norman, Mango Hill, North Lakes Environment Group will be singing some of his wildlife-related songs during the breaks between the speakers. Presentations will take an hour each including question time with a 30 min refreshment break between each speaker. Morning, afternoon tea and lunch will be supplied. Please email Vanda on info@koalaactioninc.org or mykoalas@bigpond.net.au to confirm your booking or ring her on 0407 101 837. Representative, Moreton Bay Koala Rescue Inc.
You can help protect them by supporting WWF-Australia to buy and remove the last full-time commercial gill net on the northern Great Barrier Reef! This is big news. 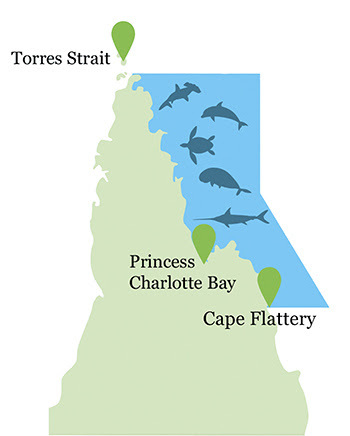 I can’t tell you how excited I am about the prospect of removing the last remaining full-time commercial gill net from Princess Charlotte Bay in the northern Great Barrier Reef. Opportunities like this, that will immediately save the lives of thousands of vulnerable sea creatures, just don’t come around very often.We’re currently deep in negotiations to buy this net. But first we need to raise the funds, so we can actually pay up once the final price has been agreed upon. It’s a bold move. And we’re relying on your help to see it through. Please, can you donate today to help buy this deadly net, and save the many dugongs, turtles and sharks that get entangled each year? 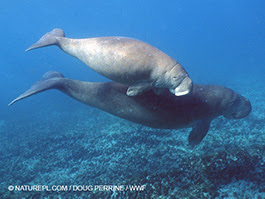 The northern Reef is home to one of the world’s biggest populations of dugongs, as well as other vulnerable marine life. 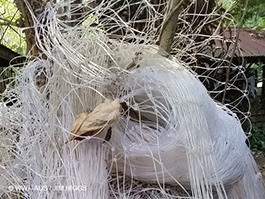 But nets such as these pose a massive threat to their survival. Gill nets hang like curtains in the sea and are designed to trap fish, however, there’s no safeguarding other sea creatures from becoming entangled. And once trapped, air-breathing animals can drown within minutes. The northern Reef should be a haven for the 6,500 dugongs that call it home, but the threat of net entanglement and drowning is growing as the area becomes more accessible to commercial gill net fishing. We can’t just stand by and let this continue. That’s why, as well as helping to buy the net, your donation will also support our work towards a ‘Net-Free North’ – the creation of a net-free zone stretching from Cape Flattery to the Torres Strait. It will mean protection from commercial gillnetting for the long-term, and will create a dugong refuge larger than Tasmania! Here’s a rough map to show you how large this area is. Imagine how much of an impact your donation could have for the incredible marine life in these waters. Once the price is agreed, which we hope is very soon, we’ll only have a very short time to pay up. That’s why your support is so urgently needed today. Please give what you can to remove this net, and help create one of the world’s biggest dugong havens on our northern Great Barrier Reef. 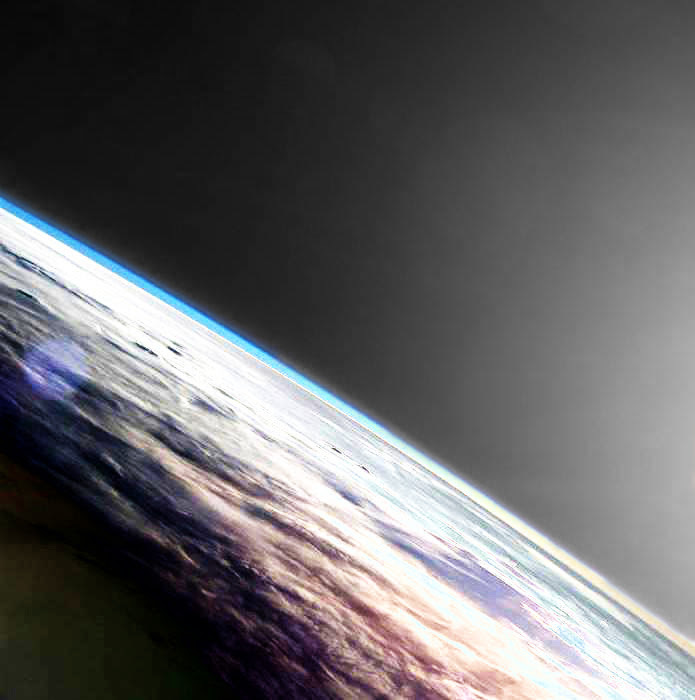 We know when we all pull together we can have a tremendous impact. Back in 2016, supporters like you helped us buy two fishing licences, saving up to 20,000 sharks a year. It was such an incredible result. If WWF supporters can all chip in again, we can do even more to protect an amazing eco-system and the wonderful wildlife that call it home. Let’s buy this net and create a Net-Free North. They are the places where renewable energy is king, a group of 22 postcodes across Australia where more than half of all houses have rooftop solar. As a nation we are wild for the power of the sun. Australia boasts 1.7 million homes with solar panels on the roof – a world-leading figure on a per capita basis. But within that achievement, which suburbs and towns are doing the best? The list of 22 postcodes that are leading the way is contained in Renewables Ready, a report issued by the Climate Council this week. So is your postcode on the list? Have a look at the chart at the bottom of this story and see how you and your neighbours measure up to Australia’s sun kings. Leading the charge is postcode 6171, Baldivis in Western Australia. The fast-growing suburb 46 km south of Perth has the highest penetration of rooftop solar anywhere in the nation at 69 per cent of all homes. It is followed closely by the Queensland suburbs of Elimbah (63 per cent uptake) and Tamborine (57 per cent). Queensland is out in front of other states by some margin when it comes to rooftop solar, 14 of the 22 postcodes on the list are in the sunshine state. And most of those are tightly clustered in the state’s southeast. Overall, 31.6 per cent of households in Queensland have solar panels on their rooves, ahead of 30.5 per cent in South Australia and 25.4 per cent in Western Australia. IMAGE: Renewables Ready, The Climate Council. The figures come hot on the heels of others released by the Clean Energy Regulator, which this week revealed that rooftop solar uptake had soared in Australia and, together with solar hot water systems, now boasts capacity of 6000 MW – enough to power the entire city of Sydney. Australia leads the world in per capita deployment of rooftop solar panels. Western Australia has seen the largest increase in the uptake of rooftop solar during the past 12 months (a 2.9 per cent jump). The below table (sourced from the report) shows the postcode with the highest rooftop solar uptake in each state. The report foreshadows further gains to come from projects currently underway that promise even more dramatic concentration of solar powered homes. In the coming Canberra suburb of Denman Prospect, it says, 100 per cent of homes being constructed will be required to install rooftop solar panels. It also points to the ARENA-funded AGL Virtual Power Plant project in suburban Adelaide, which involves installing and connecting a large number of solar battery storage systems across 1000 residential and business premises, to be managed by a cloud-based control system. ARENA has contributed $5 million towards the $20 million cost of that project. 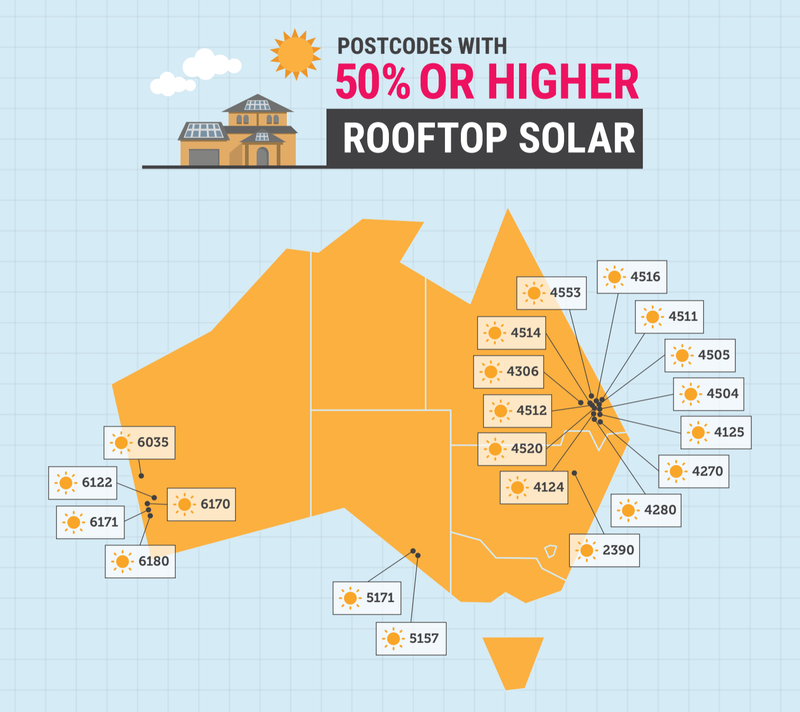 Here is the report’s full list of Australian postcodes that have more than 50 per cent of homes with rooftop solar systems. The Climate Council document takes the form of a report card, grading each state for its performance on renewable energy in a number of areas. It says the percentage of renewable sourced electricity grew in every state during the past 12 months, apart from Tasmania, which saw it slightly decline. The nation as a whole produced enough renewable energy last year to power seven million homes, the report says (quoting figured from the Department of Environment and Energy). That represents a jump in renewables production of 8.6 per cent. The proportion of Australia’s electricity contributed by renewable sources rose from 14 per cent to 16 per cent.